Modifications, some of them large scale, to cockpits of three aircraft types in the SA Air Force (SAAF) fleet are under investigation by the Armscor acquisition department. The procurement project, according to the latest Armscor newsletter, will provide for “a mass aircrew expansion” on the Pilatus PC7, the Hawk Mk120 and the JAS39 Gripen. Armscor terms it “an extensive modernisation to accommodate pilots in the 21st century and a boost to the safety of these versatile and high-performing aircraft”. The projects has its origins in concerns raised regarding the “unfair exclusion of smaller built females” to pilot the three aircraft types. “Typically, one has to be of an appropriate weight to qualify as a pilot and allow safe ejection in the case of an emergency. This weight limitation places a restriction in terms of the South African population and needs to be adequately addressed to be representative, equitable and gender aligned. “The ejection seat weight limitation stems from the cartridge mechanism in the ejection seat, where the cartridge determines the seat’s acceleration as well as the force the pilot experiences during ejection. An ejection seat can cause serious injury or even a fatality for people who fall outside the design weight limits,” according to the fourth edition of “Inside Out”. “The project introduces a newer technology cartridge, called a ‘choked cartridge’, catering for occupants of lighter weight as well as allowing increased upper weight limits. The new cartridge technology will also make the ejection seat safer for current pilots because the forces they will experience during ejection will be reduced. This in turn reduces the probability of injury during ejection. “As a result of the mass range expansion, the project will include increased anthropometric range as aircraft manufacturers now need to define new minimum and maximum body dimensions for pilots. These include sitting eyesight, leg length and arm reach. The project will introduce a back spacer for smaller occupants to enable reach of critical controls and provide a thicker base cushion to boost seating height. 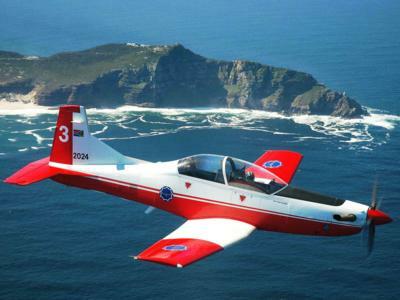 The Armscor publication says the project is “approaching realisation, with the Pilatus PC7 nearing completion”. Armscor sees the “innovation, in essence, addressing gender-related challenges as well as providing an enhanced degree of aircraft operational autonomy”.